Heavy Engineering Corporation Limited (HECL) Has published advertisement notification Applications are invited for induction of 169 [73 Graduates and 96 Technician (Diploma)] trainees for NATS session 2018-19 under Apprenticeship Act 1961. 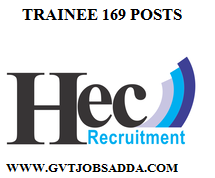 Those candidates who are interested & eligible for the HEC Ltd Recruitment 2018 candidates can check all eligible creteria & apply online before last date of apply online HEC Ltd Recruitment 2018. Vacancy Details About (HECL) recruitment given below. Mode of Selection: – The Selection will be done on the basis of % (percentage) of the marks obtained in the qualifying examination of Graduate / Technician (Diploma). Training Period & Contract: – The period of Apprenticeship training for Graduates and Technician (Diploma) shall be one year. Other Posts Might Be Interested In GIVEN Below.